Smart Email Recovery is a program designed to recover corrupted or deleted emails on Microsoft Outlook Express. It is developed by Smart PC Solutions, LLC. Recovery: Smart Email Recovery is first and foremost conceived to recover any email that has been deleted or corrupted on Outlook Express. The process is simple, only a few clicks of the mouse enable to recover emails. Access to DBX files: Outlook Express is prone to a number of problems and especially database corruption. Owing to this issue, some emails can never be recovered, especially if they are numerous. Smart Email Recovery slightly accesses the DBX files in read-only mode and extracts all recoverable information. Output: the extracted files from DBX files will be saved in EML files. Thanks to this, emails can be exported directly to Outlook Express or other email clients. Headers, main message body as well as attachments and hyperlinks are kept at hundred percent. Batch recovery: even if several damaged emails are recorded, Smart Email Recovery can still manage to recover them all. This avoids time wasting. 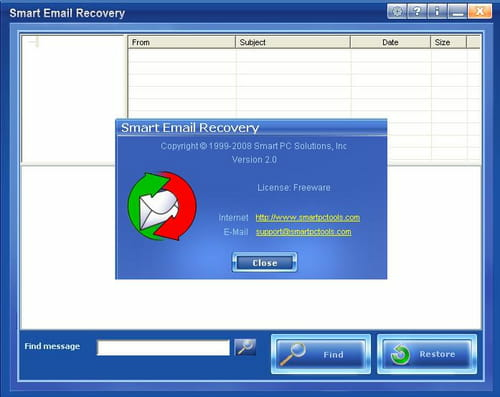 Smart Email Recovery is downloadable free of charge. The interface is intuitive and graphical making it easy to handle. This program is not available for other emailing protocols. Latest update on November 21, 2016 at 05:37 PM.